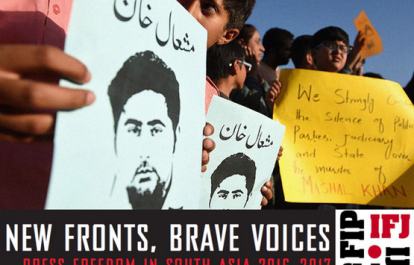 Welcome to the monthly e-bulletin of the South Asia Media Solidarity Network (SAMSN). The next bulletin will be sent on June 15, 2017, and your inputs are most welcome. The IFJ and the SAMSN marked World Press Freedom Day 2017 by releasing New Fronts, Brave Voices: Press Freedom in South Asia 2016-17 on May 3. 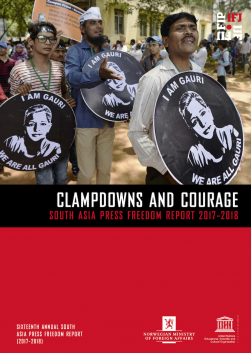 The report documents the deteriorating press freedom situation, media rights issues, as well as documenting national and regional activities that are empowering journalists to confront press freedom challenges in South Asia. 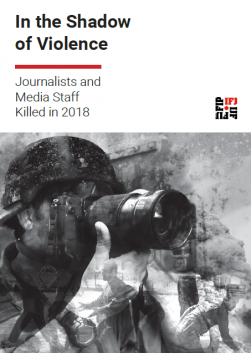 The 15th annual report by SAMSN noted that 19 journalists, bloggers and media workers were killed in the year, with Afghanistan recording eight killings. 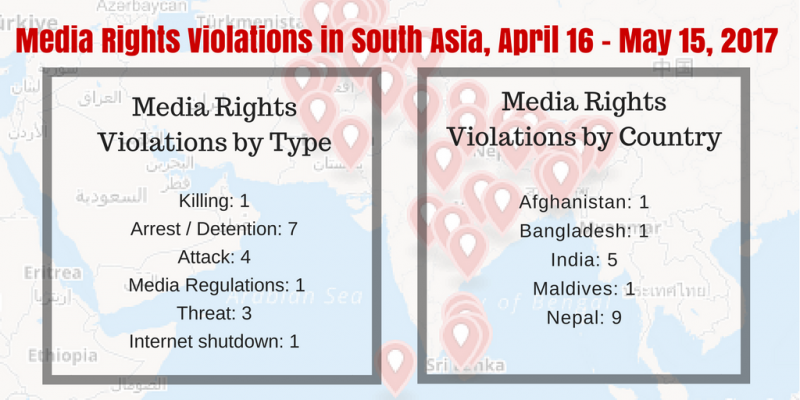 This report highlights increasing internet shutdowns in South Asia, now the world’s leading region on virtual curfews; and the rise of online harassment, along with special reports on impunity and gender equity issues in the region’s media. Read more here, download the report here and read media coverage of launch event in India here and in Nepal here. IFJ-affiliates and SAMSN partners across South Asia marked the World Press Freedom Day on May 3 organised events and programs. In Sri Lanka, the Free Media Movement (FMM) in association with the Sri Lanka Press Institute (SLPI) hosted organiseda panel discussion on “Media Freedom, Social Responsibility and Regulation” in Colombo. The panelists discussed the proposed media regulation draft law of the government and included M.J.R. David, from the University of J’pura; Jagath Liyana Arachchi, director of Information Grid, National Media Center;, Hana Ibrahim, editor, Weekend Express); and Shehan Baranage, director/news, Derana TV. More here. The Sri Lanka Working Journalists’ Association (SLWJA) ran an impunity campaign with the slogan ‘make disappearances of people a criminal offense’ in Colombo on May 3 and will host a public seminar on Tuesday, May 16. More here. In Nepal, the Federation of Nepali Journalists (FNJ) launched the IFJ / SAMSN report with support from UNESCO Kathmandu Office. The event attended by journalists and activists, included UNESCO’s representative to Nepal, Christian Manhart, FNJ president Dr Mahendra Bista and NHRC commissioner Sudeep Pathak who released the report. Earlier in the day, the FNJ organised a press freedom day rally in Kathmandu. More here. In Afghanistan, the Afghan Independent Journalists Association (AIJA) organised programs across all of its provinces nationally to celebrate the day. More info and photos of the events are on AIJA’s Facebook Page here. In India, the National Union of Journalists (India) held a seminar to discuss “Challenges before the Changing Media” in New Delhi with NUJI president, Ras Bihari, leading discussions. More here. 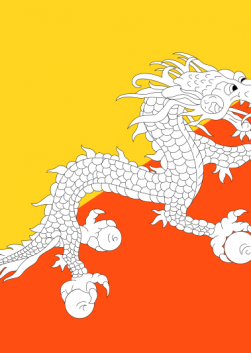 In Bhutan, IFJ-affiliate Journalist Association of Bhutan (JAB) recognised 21 journalists for excellence in journalism at an award function in Thimpu. JAB also launched the first edition of Bhutan Press Mirror: A JAB Occasional Journal which will highlight the situation of journalism in Bhutan through opinion pieces and JAB’s activities. More here and Bhutan Press Mirror can be downloaded here. Pakistan Federal Union of Journalists (PFUJ) celebrated the World Press Freedom Day across Pakistan as a “day of solidarity” with Dawn newspaper, to reject any action against the newspaper after the October 6 publication of critical news report about military-civilian leadership divide based on leaked government documents. Blogger and social media activist Yameen Rasheed, 29, was murdered at his residence on April 23. An influential blogger and social media activist advocating for rule of law, human rights and social justice in the Maldives, Rasheed was found with multiple stab wounds in the stairway of his apartment building at 3am. He was taken to hospital where he died soon after due to excessive blood loss. Reports indicate he had 16 stab wounds on his body, including 14 on the chest, and one each on his neck and head. Rasheed was an outspoken critic of the government and religious intolerance in the Maldives, popularly known for his satirical English blog, The Daily Panic. Over the past year, he received numerous death threats from various groups. Rasheed reported the threats to police and had posted screenshots of the warnings he received as text messages on social media. He had also complained on social media about police inaction in responding to his complaints. Read more here. Forty-nine rights groups strongly condemn the brutal murder of popular blogger Yameen Rasheed in the Maldives in what is believed to be an attack motivated by his political and social commentary. Signing a statement, the groups urged the Maldivian authorities to hold all perpetrators to account and to implement reforms to improve the broader free expression environment in the country. More here. On May 9, the Supreme Court of India issued an order banning news media from publishing statements by Calcutta High Court judge CS Karnan, who accused other senior judges of corruption. A bench headed by Chief Justice Jagdish Singh Khehar, while sentencing Justice Karnan to six months in prison on charges of contempt of court, ordered that “since the incident of contempt includes public statements and publication of orders made by the contemnor, which were highlighted by the electronic and print media, we are of the view, that no further statements made by him should be published hereafter”. On May 5, police beat up journalists covering protests after the Friday prayers in Sopore, Kashmir. The Station House Officer (SHO) of Sopore Mudasir Geelani reportedly led the police attack, in which Varmul Post photojournalists Eeshan Peer and Mohd Younis, both from Gulistan, Kashmir, were injured. In another incident, four unidentified people beat up Telugu TV channel reporter Nallamilli Rama Reddy, at Pittala Vemavaram village in Andra Pradesh on May 3. Reddy, who had recently filed two stories on illegal sand mining, was seriously injured and taken to hospital. On May 1, New Delhi police officers assaulted journalist Meghnad Bose, of The Quint, while he was recording a Facebook live video. Bose was held by policemen, slapped multiple times and detained inside a police van for 30 minutes before being driven to the police station. On April 26, the Jammu and Kashmir government ordered all Internet Service Providers (ISPs) in Kashmir to ban 22 social media sites and messaging apps including Facebook, WhatsApp, Google, Skype, Viber and Twitter for one month on grounds that they were being “misused by anti-social elements by transmitting inflammatory messages in various forms”. The order issued by Principal Secretary (Home) R K Goyal under the Indian Telegraph Act 1885, asked all the ISPs to immediately stop transmission of Facebook, Twitter, WhatsApp, QQ, We Chat, Qzone, Tumbir, Google , Baidu, Skype, Viber, Line, Snapchat, Pinterest, Telegram, Reddit, Snapfish, You Tube (upload), Vine, Xanga, Buzznet and Flickr until further notice. The order came as Kashmir continues to reel under violent demonstrations that have occupied the region since July, 2016, when young militant Burhan Wani, was killed by Indian security forces. Mobile internet 3G and 4G internet services were suspended in the valley after a renewed round of students’ protests erupted in mid-April. Read more here. Two United Nations human rights experts have said that India must immediately end its ban on social media networks and on mobile internet services in the State of Jammu and Kashmir and guarantee freedom of expression for citizens. “The internet and telecommunications bans have the character of collective punishment,” stressed the UN Special Rapporteur on freedom of opinion and expression, David Kaye, “and fail to meet the standards required under international human rights law to limit freedom of expression.” More here. Bangladeshi editor Ahmed Razu, the executive editor of natunsomoy.com, was arrested on May 1 in his Dhaka office under the Section 57 of the ICT Act. Razu was arrested following complaints to police by private business enterprise the Walton Group, which accused him of tarnishing the company’s image by deliberately publishing fabricated news. The website published a number of news articles which criticised the after-sales service of the the business, particularly regarding its phones and motorcycles. Razu was formerly a journalist with a Walton Group-owned newspaper. The court remanded him to one-day’s custody in two cases filed by the Walton Group and released him on bail granted by the Dhaka Chief Metropolitan Magistrate’s Court on May 3. The company has filed a case for falsifying two news reports, and an extortion case. Razu alleged that the company filed the cases to harass him, and stated that the allegations were fabricated. Read more here. A number of press freedom violations were recorded ahead of local level elections in Nepal. Tilak Adhikari, editor of Janata Jindabad weekly, was arrested at his residence in Makwanpur district on May 11 and Thakur Prasad Timalsina and Gambhir Pathak, FNJ members in Kathmandu district, were arrested on May 10. In Parbat district, journalist Gopal GC of Nabadristi Online was arrested on May 4 and Pustaman Gharti was arrested on May 8 in Rolpa district. Hari Bishnu Oli, editor of Sikhchya Sanjal weekly, was arrested on May 2 in Rukum district. The police didn’t say why the journalists were arrested and detained. Photojournalist Ajay Desar was attacked by unidentified people on April 24 in Nakhipot, Lalitpur and his camera was damaged. In Nuwakot district, journalist Dev Chandra Bhatta was harassed by patrolling police for taking photographs. Similarly, Anjaan Dahal of online portal Filmykhabar was threatened over news by an unidentified person on May 6. In another incident, Shivahari Ghimire of Nagarik daily, received a threat on May 6 over news of illegal deforestation. Read more here. On April 19, Ariana News reporter Atillah Noori was threatened and insulted by the guards of the chief of provincial police Mohammad Pahlawan in Sar-e-Pul province in northern Afghanistan. During the attack, an intervention from local people saved the reporter. He was denied access to anyone while in the police department except for an interview with the Pahlawan police on April 7. Read more here. “You never know what’s in store in the future. I could get killed, or I could live a normal life,” Yameen Rasheed said. Ujjwal Acharya pays tribute to his friend, Yameen Rasheed, a bold and courageous voice of dissent in the Maldives, silenced in the prime of his life. Read more. Over the last 16 months, issues of press freedom, freedom of expression, online freedom and personal freedoms have come together to produce an overall sense of shrinking liberty not experienced in recent years in India.On World Press Freedom Day 2017, the Hoot published a report that states ‘it becomes important to view the level of press freedom in India in the wider context of societal freedom. The press cannot be truly free when facilitating freedoms such as the Right to Information and the Right to Internet, and the freedom of expression of the creative community, are shrinking.’ More here. The government of Sri Lanka is moving towards its promise for full media freedom while also expecting high standards from media as well, Deputy Minister of Parliamentary Reforms and Mass Media Karunaratne Paranavithana said. Addressing World Press Freedom Day Conference in Jakarta on May 3, the Sri Lankan minister said the government will seek high standards in media in Sri Lanka through the establishment of an independent media commission. Read here. In 2016, Bangladesh faced another violent and repressive year for freedom of expression and press freedom. Brutal attacks on journalists and online activists, and the use of unfair laws and criminal defamation provisions which clearly violate international standards, continued to stifle free speech. Over the course of the year, Article 19 recorded 320 violations, including three murders, against 141 journalists, three online activists and three officials of a publishing house. Local journalists faced the brunt of these violations compared to journalists in the capital, Dhaka. More here. Pakistan government on May 10 released the administrative decisions taken after the findings of an Inquiry Committee probing leaks of meeting minutes to Dawn newspaper’s senior journalist in October 2016 directing newspaper owners’ representative body, All Pakistan Newspaper Society (APNS), to take “disciplinary action” against the editor and the senior journalist who had filed the story. “The government’s directive to APNS to take ‘disciplinary action’ against Dawn editor and its assistant editor is departure from the constitutional right to free press,” Freedom Network said in a Press Freedom Alert. More here.